Parents these days are overcome with anxiety — anxiety about their kiddo’s achievement (or lack thereof), ability to get into college, ability to get a good job, etc etc. For better or for worse, a significant amount of time in my coaching sessions with teens is spent helping them figure out how they can get ahead of their parents’ anxiety. One tip I’ve been working on with several of my clients is how to initiate communication with their parents early on, before parents have time to nag. Listen in to this video for the nitty gritty details of this simple trick. 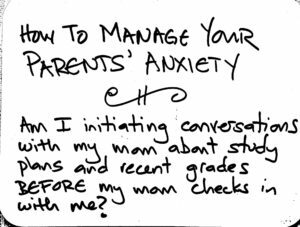 If you do not have time to watch the video below is a great tip for you to use to help manage your parents’ anxiety about your school work. 3 Tips to Take Action on Hard Assignments! A Surprising Benefit of Turning Off Notifications!